Discussion in 'Blogs' started by Tek7, Feb 9, 2015. 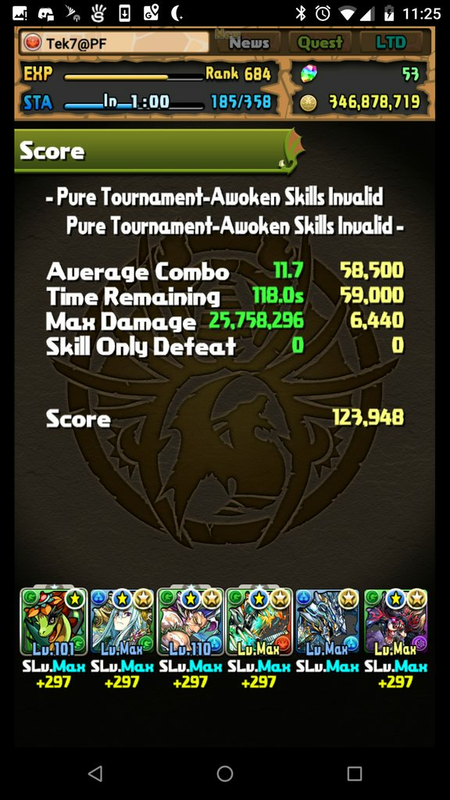 I went 0/9 on Fuu skill-ups during the Shinrabansho collab and gave up on skilling up Fuu. 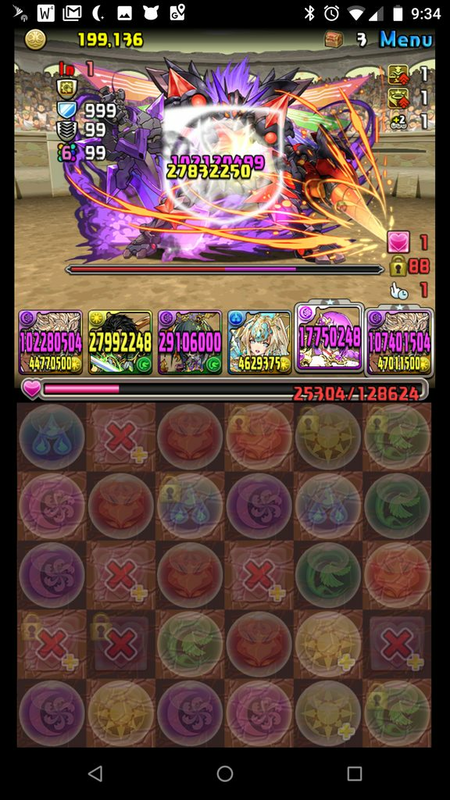 I haven't played my LMeta team for serious business dungeons in a while, I don't have Venus, I don't have Raphael, and I've said on numerous occasions that I'd quit PAD before I'd set out to max-skill Sandalphon. It's doubtful I'll ever run a light row team, so Fuu, unfortunately, may never find a spot on any of my active teams. Things could and I believe would change swiftly if I were to pull Thor, so I'm not ruling out the possibility she'll see action some day, but for now, alas, she collects dust. foxwaffles and bookwyrm like this. 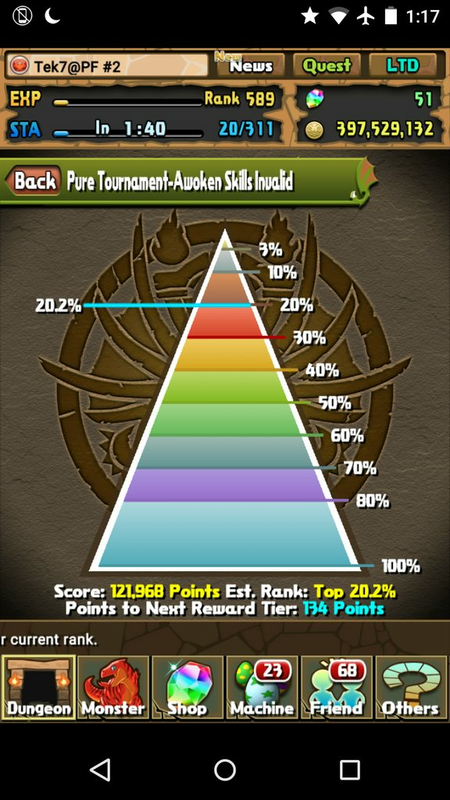 Blew through a full stamina bar on each of my accounts, then ranked up on both and failed twice more in co-op. 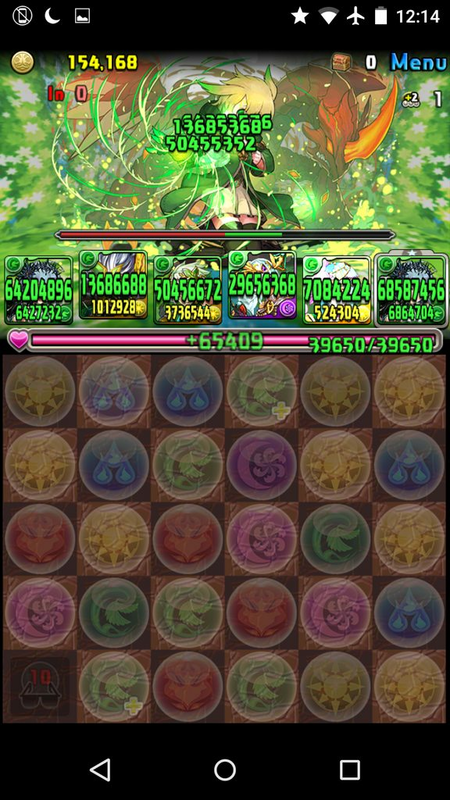 Finally caved and attempted C9 solo on my main with a DMeta team. Failed twice, then cleared it on the third attempt. It was a horrid dungeon. EDIT: Here's the solve, by the way. 5 combos + 2 combos from Khepri's active = 7 combos. Yeah no. Not after rolling 5/6 dupes during part 1. The only new rolls during this fest were Ishida (free roll) and Ame on my alt and Keiji #1 (free roll) on my main. Final results: 120 stones spent. 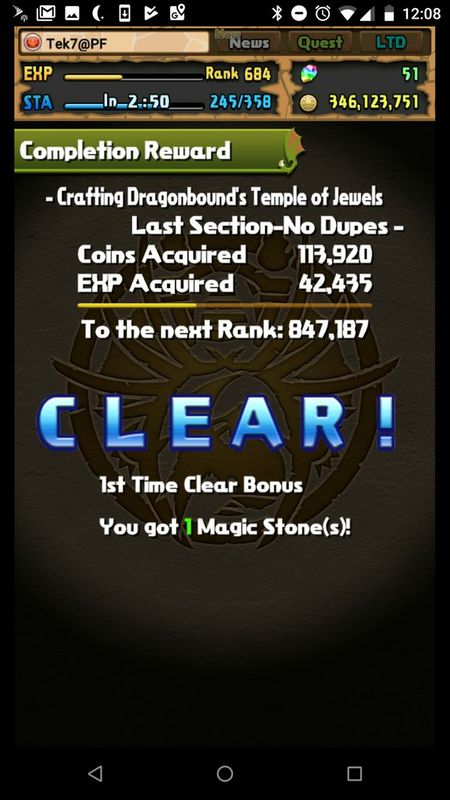 11/14 (79%) dupes. 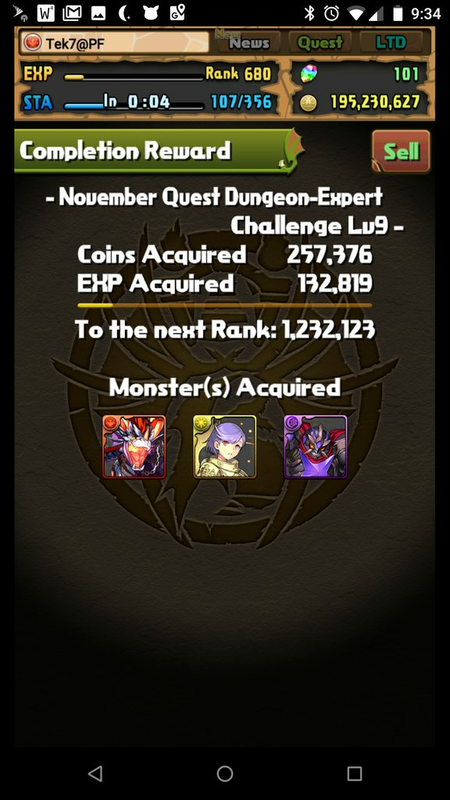 Given the awful experience I had trying to clear C9 in co-op and the almost entirely awful REM fortune I've had since August, I'm no longer planning to clear all November monthly quests on my alt. 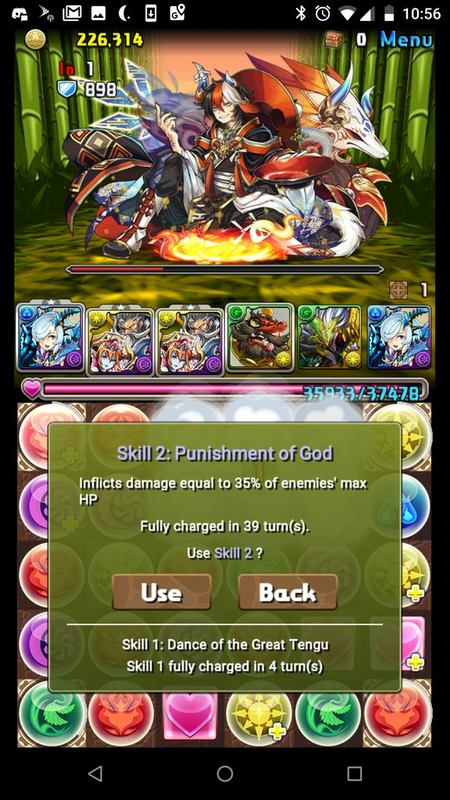 At this time, I'm planning to skip C9 and C10 and I might skip C8 and Rushana on my alt. I still plan to clear all November quests on my main. Oh my word, I pulled a dupe Cotton on my alt on 7/31 or 8/1 and I still haven't evolved her. Thanks to @Kreisler for the super-useful LIdeal. I really wanted Enra on my alt and I don't know what I'll do with Distel (already have a solid Blonia team, got RagDra for dark coverage on Rikuu teams, Distel is outclassed by King Plessie as a lead, and so on), but hey, it's new and a crystal egg is a crystal egg. 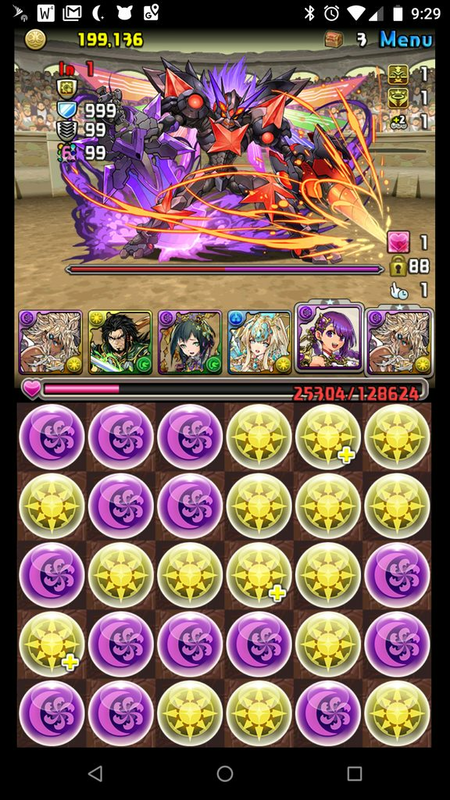 Maybe we'll see some stronger L-attack awakenings + 5o1e leads in the future? I'm still perplexed as to why Vigo exists except as fodder to make the chase cards shine even brighter. 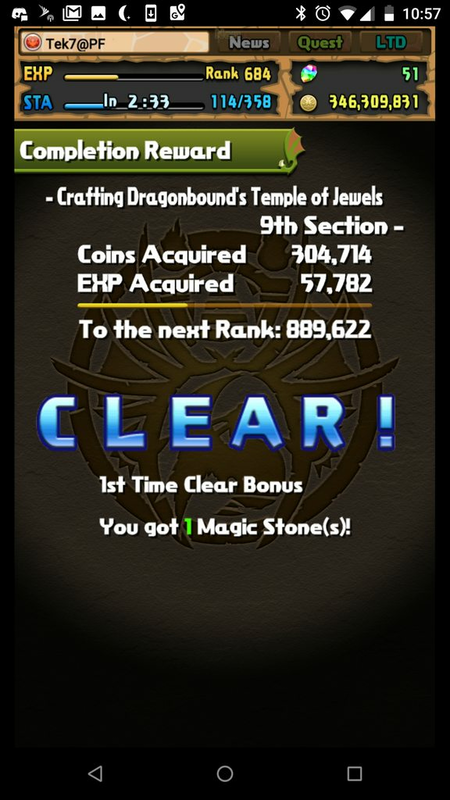 Overall, yet another disappointing return on a stash of saved stones (20 on my main, 30 on my alt). These results are consistent with trends dating back to August. 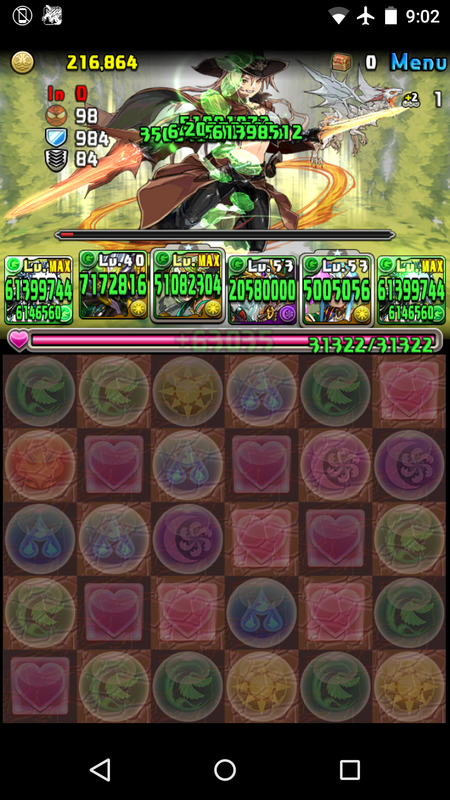 Cleared F1-F7 of the DBDC OSC so far. But that may be as far as I go. F8 is brutal, Warframe is out on Switch today, I recently bought River City Ransom: Underground (only $3 on Steam right now! 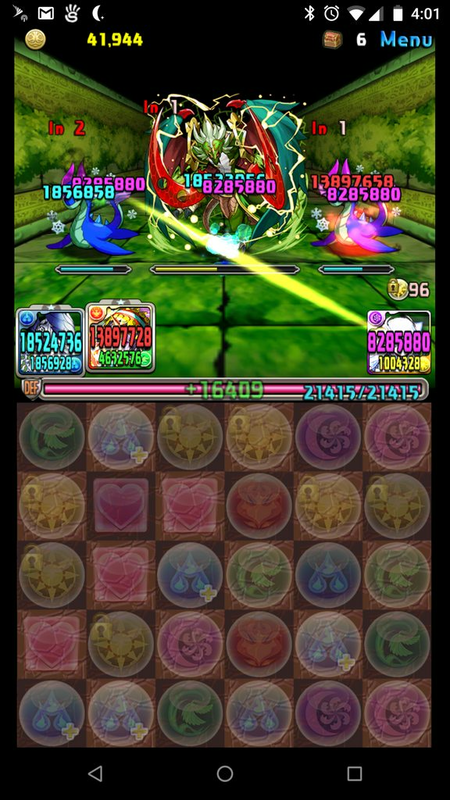 ), and Chuan is a cool card (I guess) but not worth banging my head against yet another "Let's cram as many obnoxious mechanics as we can in to one dungeon" dungeon that GungHo seems to favor these days. F1-F7 was actually fun (especially running NY Kami x Mai with a team full of Gold Keeper subs on my main for F2), but F8 has been the opposite of fun so far. 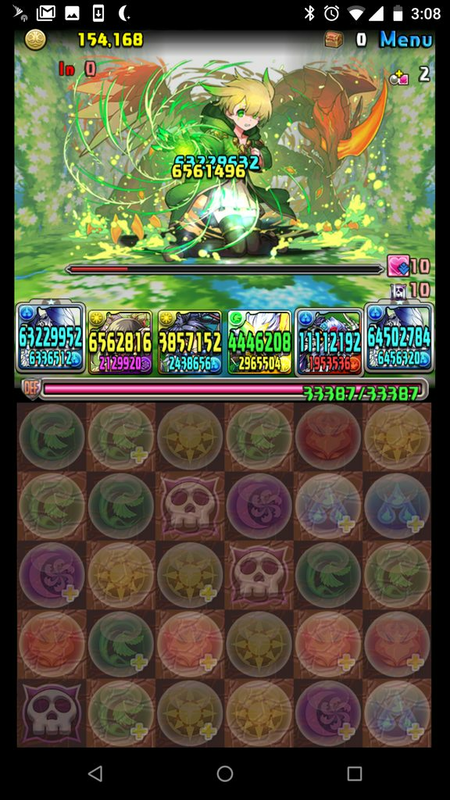 FINALLY cleared F8 with a DMeta team on my main last night, but only 3 skyfall combos gave me the 8 I needed after I matched VDP + 5c on the boss floor in a "do or die" play. Then I cleared F8 on my alt just now with Zela with much less stress. 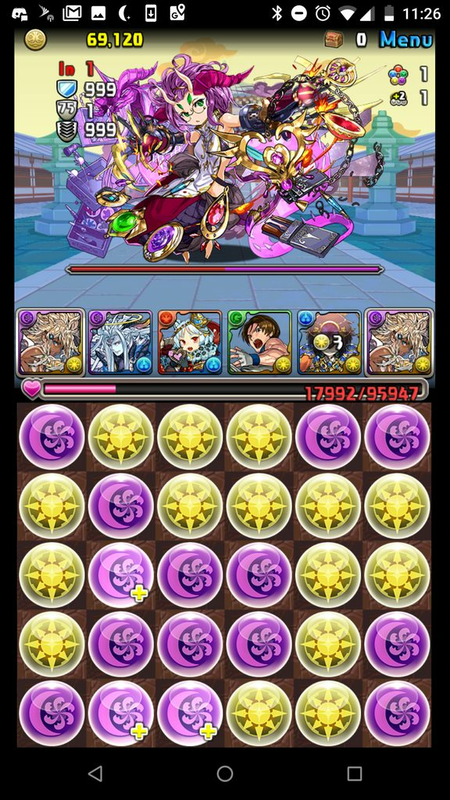 I had hesitated to evolve Zela from her base form because she pairs so well with Mega Sylvie and both my main and alt have strong wood boxes, but I'm glad I took the plunge because G/G Zela may very well be the strongest lead on my alt. Maaan that sounds like so much fun, but I don't think I could bring myself to devolve Reeche OR evolve my only Famiel and lose a water attribute 100K laser active. 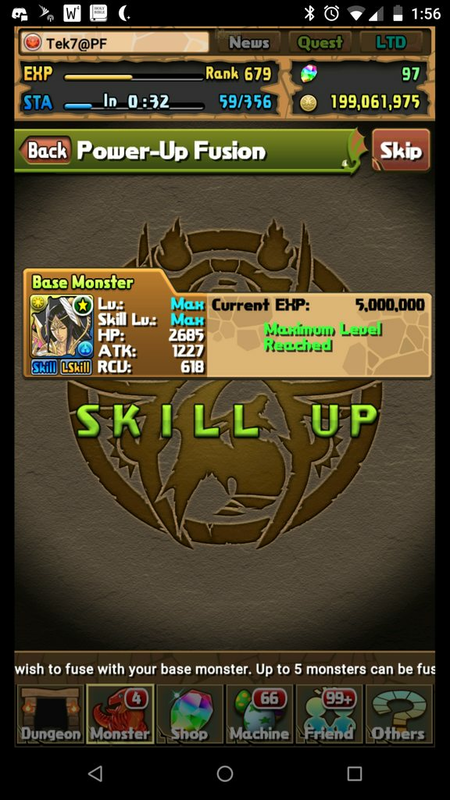 At least I have 3 Lumiel, so I'll evolve one to Awoken and maybe run her as a dark row lead? EDIT: I think I'll leave my Ruel in her current form. 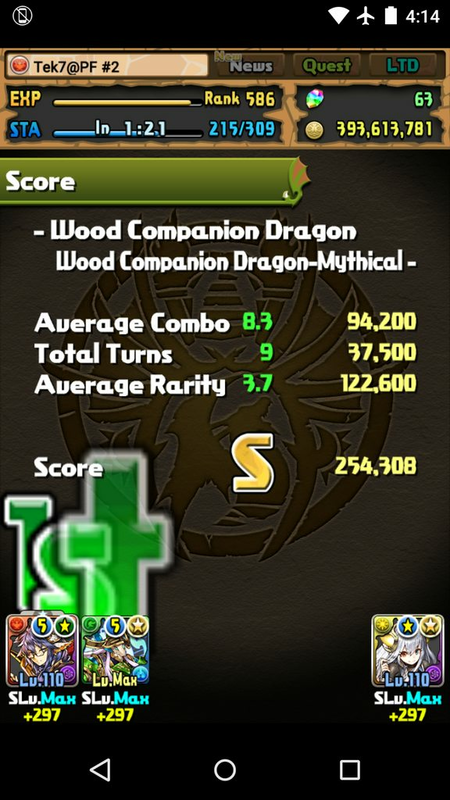 She makes a surprisingly good Kami sub on a wood-focused team. Oof. I'm very pleased to have cleared this challenge set, but I need to take some time and re-evaluate my priorities. I invested way too much time and mental energy in clearing F8, F9, and F10. As I'm approaching 1700 days on my main account, I feel more strongly than ever that it's time to take a step back, commit to playing more casually, and stick to that commitment. But for tonight, I will celebrate this victory. Updated thread title 11/22 after spending $1.99 on the DBDC + 2 MS bundle earlier this week. 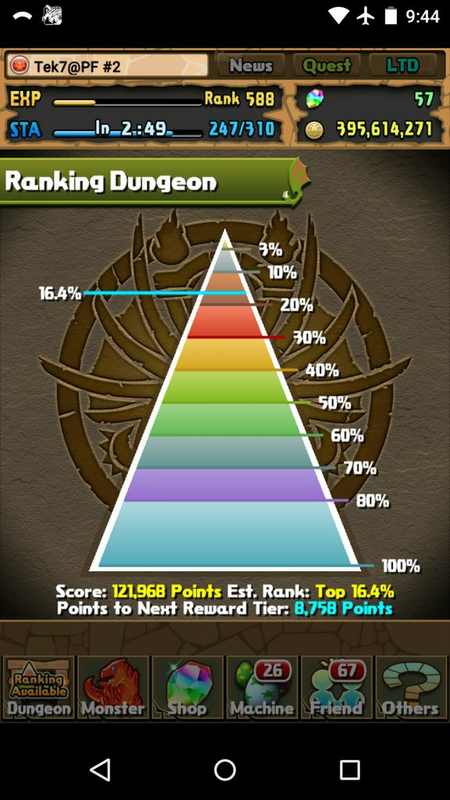 I'm really, REALLY hoping these hold in the top 20% because I absolutely loathe this ranking dungeon now. Scores have slipped to 14.9% on my main and 16.6% on my alt as of 11/23 1:52 p.m. Central. I guess I could flush stamina on skilling up a Formula on each account by running November C2 solo, but 4 runs (2 on each account) have yet to yield a single skill-up. 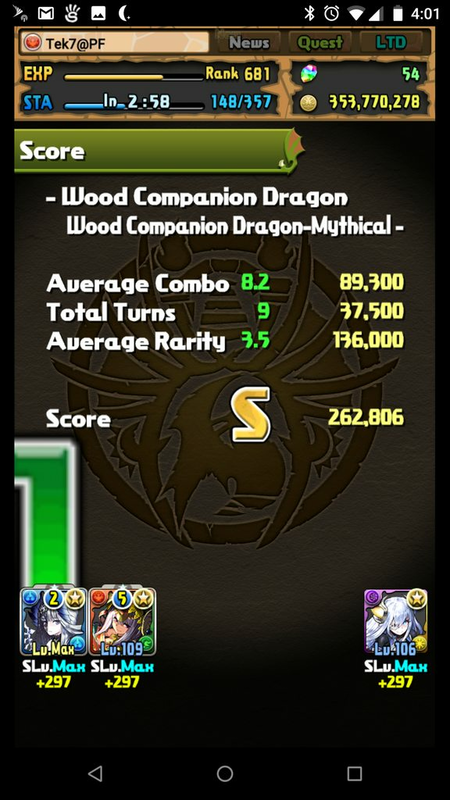 I could also swap Fenrir Knight for Marine Rider on my main to improve my odds of hitting the damage cap, but I already spent 3 stones on my main (0 on my alt, thank goodness) to get the score I did. Random chance continues to disappoint. Decided to roll twice more on my alt. 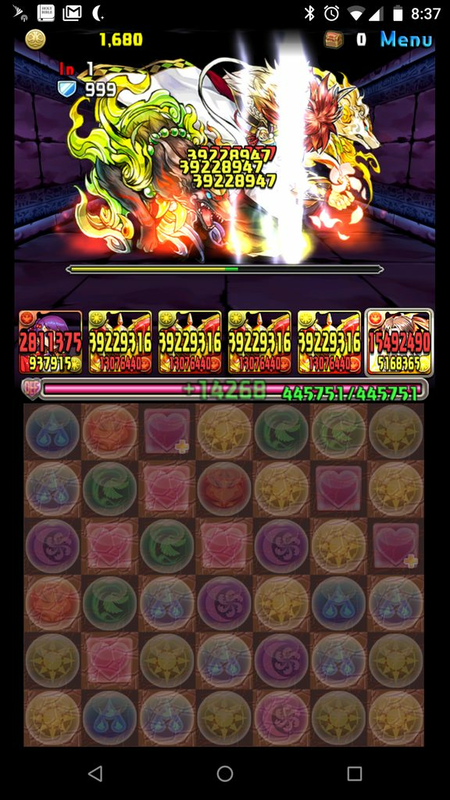 Had a nearly perfect run with Rikuu x LIdeal then fell 1 combo short on Hanuman. 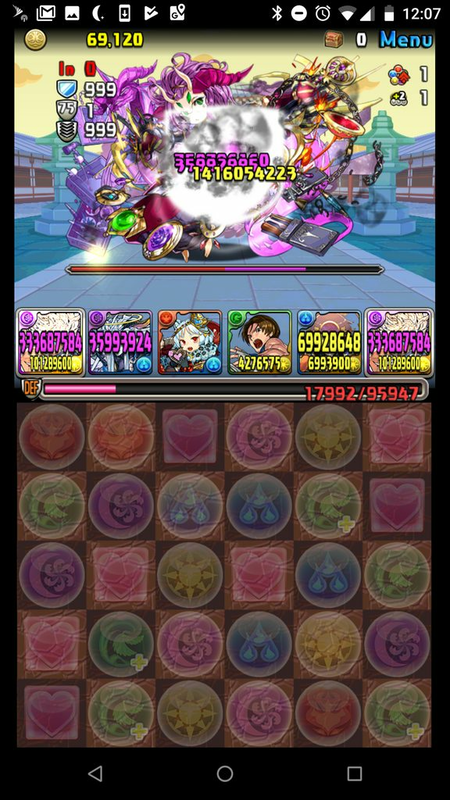 Had another great run with Rikuu x LIdeal but I didn't have enough colors to activate after popping the Merlin active and I didn't get the skyfall. Oh well. I don't think I had any use for Pure anyway. If I ever find a use for her in the future, I can spend some of my 1.9 million MP to buy her. 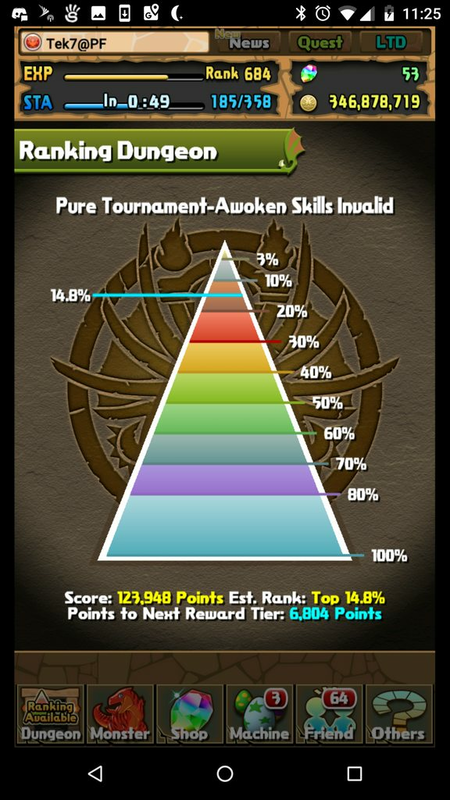 EDIT: But hey, at least I stayed in the top 20% on my main.